Jae Dobbs with Officer Joe Dunsmoor. Inside a small office of the downtown police precinct at the Intermodal Center, Jae Dobbs, a 23-year-old mental health clinician with Frontier Behavioral Health, is about to dig into her packed lunch. Suddenly, Neighborhood Resource Officer Joe Dunsmoor, 42, walks in. He's run into a homeless man outside the building. The man, Dennis Michael Cronin, is a familiar face to both Dunsmoor and Dobbs. "He's not staying anywhere right now," Dunsmoor says. Cronin says that he slept on a park bench at Lewis and Clark High School last night, was recently trespassed from his former apartment, occasionally uses meth and marijuana, and took some pills that he found on the street earlier to help alleviate joint pain. "I was going to go in and chill out a bit," he says, referring to the Intermodal Center's waiting area. Dobbs eventually asks him if he'd like to go to the Catholic Charities shelter that's only blocks away, where a private bed with a designated case manager is waiting for him. Cronin agrees and Dunsmoor and Dobbs give him a lift in their squad car over to the shelter. 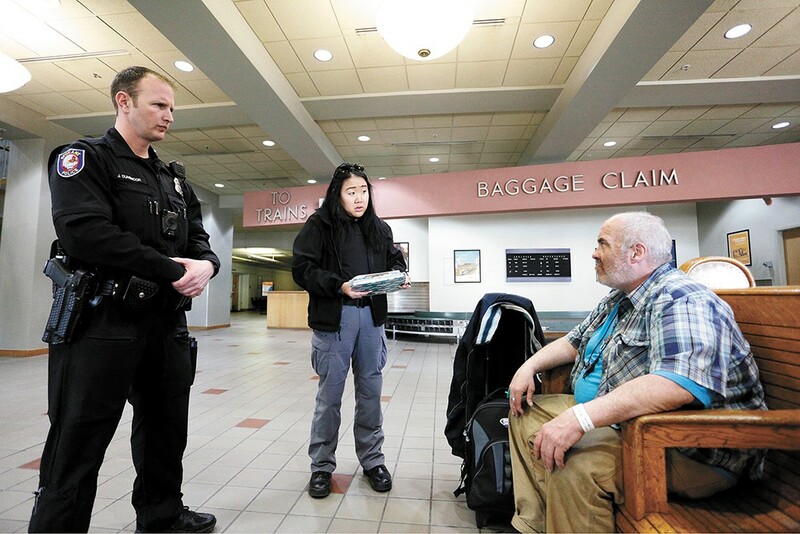 The episode is indicative of the work of Community Diversion Unit, an innovative new grant-funded program that pairs mental health workers with Spokane law enforcement to help get people suffering from addiction, mental illness and homelessness connected to services and keep them out of jail and crowded emergency rooms. Operational since last summer, the Community Diversion Unit currently consists of four full-time mental health clinicians from Frontier Behavioral Health who ride along with patrol officers five days a week, respond to 911 calls, and offer referrals to a variety of services, ranging from substance use disorder treatment to shelter beds. Mariah Rhodes, director of transitional services at Frontier Behavioral Health, says that the program is intended to increase diversion and decrease recidivism in the legal system, as well as keep people out of emergency rooms — assuming that they don't have any dire health conditions. But, "primarily what they're doing is decreasing incarceration," Rhodes adds. Officer Joe Dunsmoor and Jae Dobbs talk with Dennis Michael Cronin. This is done through the mental health worker coordinating with their assigned police officer for the day to set up alternative plans (such as securing a bed at a mental health or drug treatment facility) for a given individual, assuming that they're willing to accept services, don't pose a significant safety risk, and have only committed low-level misdemeanor offenses, if any at all. "As this program developed, you could see more officers seeing the benefit of having us," Dobbs adds. "We'd get other officers saying 'Hey, can your mental health person come up to where we are?'" Officer Dunsmoor says that, when he's out on patrol with Dobbs, he usually won't wait for a criminal violation to take place to engage people: "If Jae's riding with me, I try to ask them if they need any services because she's here and it's a great opportunity, you know?" "There's been a ton [of people] who have been diverted from hospitals and being taken to jail when there was a more appropriate solution." According to Frontier Behavioral Health's internal numbers, the program is proving successful. To date, roughly 700 people have been contacted by the unit, and around 487 of those individuals were diverted, meaning that they weren't transported to an emergency room, involuntarily hospitalized — state law allows for involuntary hospitalization if a person is deemed a threat to themselves or others — or arrested when the unit found them. Additionally, Rhodes estimates that only 25 percent of those 487 people have been contacted a second time by the unit. "Overall, as a program, it's definitely making a difference," Dobbs says. "There's been a ton [of people] who have been diverted from hospitals and being taken to jail when there was a more appropriate solution." 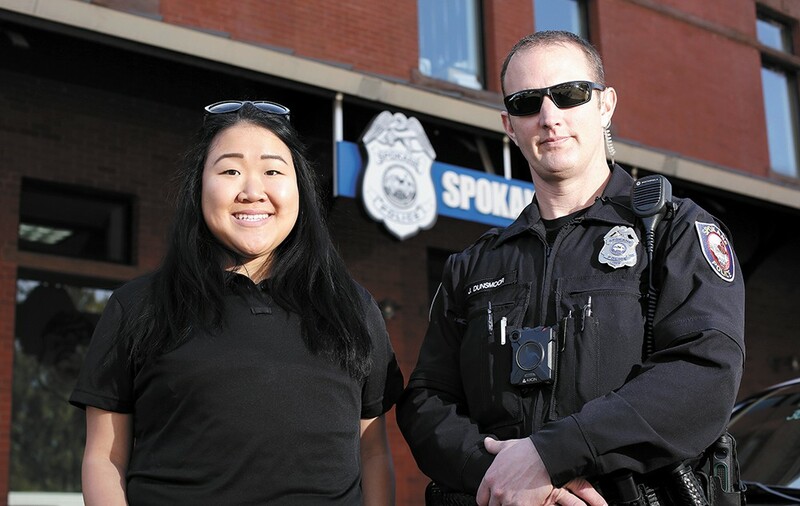 Steve James, an assistant research professor at Washington State University who works on policing issues, says that Spokane is unique in establishing the Community Diversion Unit model. "For a city of our size, there's no one else doing as much," he tells the Inlander. "Spokane is really punching above its weight." Still, some officers are hesitant to call the program a smashing success. "There's a lot of people who refuse the help. Some people are just unwilling to get off the street and go into treatment or see mental health services and take their meds," says Sgt. Jason Hartman. "Then we just end up having to deal with the behavior-specific issues: 'Are you committing a crime?'" "Does it always work? No. But they have some decent success stories," he adds. While the Community Diversion Unit may not look like standard policing, the impacts are just as tangible for those touched by it. As Dobbs and Dunsmoor drop off Cronin at Catholic Charities, Michael Jones, a homeless man with heavily bandaged fingers due to frostbite, approaches them, begging to be taken to the Union Gospel Mission men's shelter and addiction recovery facility. "You can run my name if you want to make sure that I don't have any warrants," Jones says through the tears. "There's no reason to run your name, Michael. I trust ya," Dunsmoor responds as he drives. "I think it's most important for you to make yourself comfortable at the UGM for now." Minutes later, Jones says: "You seem to be a really stand-up police officer." The deployment of the Community Diversion Unit is also illustrative of police officers' increasing role as the front-line response to homelessness and behavioral health issues, such as mental illness and addiction — serving as both enforcers of the law and social workers. "The bottom line is police are dealing with a significant public health problem that our public health system is not equipped to deal with," says Jacqueline van Wormer, an assistant professor of criminology at Whitworth University. "When we lack the necessary facilities, when we lack proper resource investment, law enforcement becomes the de facto response." "I don't think Sir Robert Peel, the father of modern policing, ever envisioned that this is what cops today would be dealing with," James says, referring to addiction and mental illness. Looming on the horizon is the question of how to keep paying for the program: The grant paying for the program is set to run out after 18 months. (Money from a recent settlement in the infamous Trueblood case, where the state was sued for not giving mentally ill inmates timely competency evaluations, is paying for the grant.) Rhodes says there may be more money available from a second round of grant funding from Trueblood, but it's still up in the air. The original print version of this article was headlined "Point of Contact"